If you are looking for the very best pizza in Marin County go to Rocco's !!! I have eaten here many times I've several years it has always been great pizza and service you will not be disappointed at all. The friendly staff at Rocco's are always smiling, friendly and patient! I really love that! And what a slice! 2 large slices of delicious pizza, of your choice from their many options, with a drink all under $5, a rare find in Mill Valley! I love it there! I would always go back. 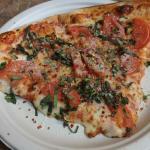 There is a tremendous choice of pizzas as this pleasant little spot in Mill Valley. You can have one slice or a whole wagon wheel of a pizza. The kids absolutely love it and who are we to argue with that? Salads, drinks and fries are also available - and they deliver. Yeh, let's hear it for Roccos. Lots of good pizza in Mill Valley - but Rocco's is my favorite. the right amount of sauce. Generous with the cheese. Great crust. Recommend it highly. Been to Rocco's Pizza & Pasta? Share your experiences!